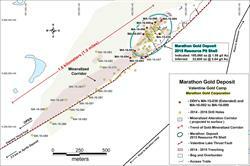 TORONTO, ON--(Marketwired - July 06, 2016) - Marathon Gold Corporation ("Marathon" or the "Company") (TSX: MOZ)announced today the results from the ongoing summer 2016 drilling campaign at the Marathon Deposit, Valentine Gold Camp. Shallow drilling has succeeded in expanding the mineralized corridor northwest into the hanging wall as well as intercepting significant mineralization in drill holes along the southwest end of the current Marathon Deposit resource pit shell (Figure 1). The extension of MA-15-039 succeeded in intersecting high grade mineralization at deeper levels within the lower open pit level. 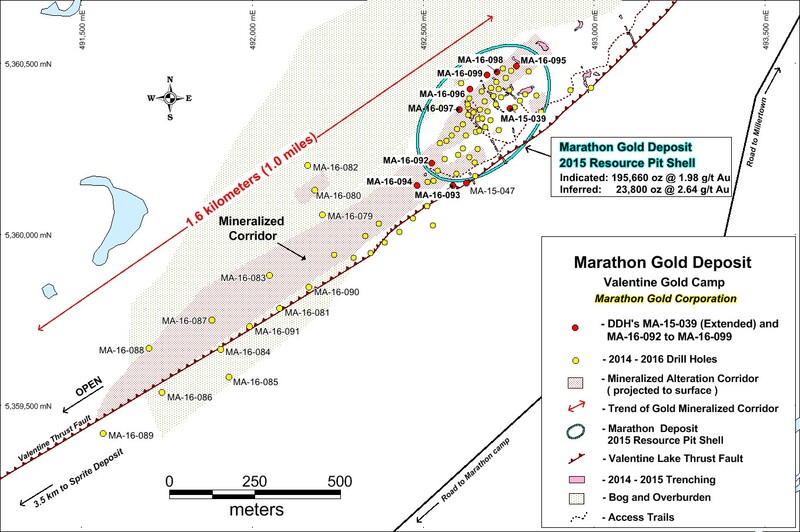 The Marathon Deposit remains open along strike and to depth with a total strike length of the mineralized corridor now extending for at least 1.7 kilometers.